It is 1976 and England is suffocating. The long, dry spring has given way to a summer of severe drought, with standpipes in the streets and a rallying cry to ‘save water, share a bath!’ For the farmers, life has become a living hell – a daily struggle to make ends meet. The fields are tinder dry, the earth is dusty and scorched and the rivers are drying up to a trickle. Jess and Tom live on a remote farm in the English countryside with their increasingly difficult and brutal father, Henry. Their mother, Sylvie, walked out years before and Jess is struggling with the role of mother figure to Tom, as well as skivvy and hired hand for her father. Jess just wants to be a normal teenager, to go to dances and kiss boys, to take her exams and dream of a future far away from milking cows and ploughing fields. Daydreaming about her mother’s return, Jess discovers Sylvie’s old diary and begins to uncover the shocking truth about her disappearance. 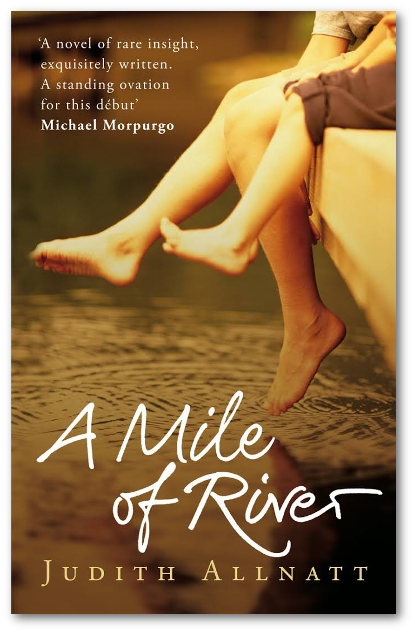 As the drought grips ever tighter, as the water level of the river begins to drop, the menace in the air builds until it reaches boiling point, with a confrontation between Jess and her father that has devastating consequences. 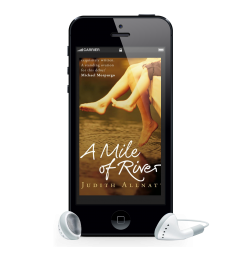 I started writing A Mile of River during a very hot spell one summer when the countryside turned crisp and brown. My mind flew back to the summer of 1976 when no rain fell in the Midlands for a hundred days. What would it have been like trying to keep a farm going then, I wondered, with your livelihood drying up around you? And what effect would it have on a farming family, where even the kids were expected to pull their weight: especially a family with only one parent around? My heroine, Jess, a determined seventeen year old, her young brother Tom and her controlling father, Henry, were born. The intent of the book was to explore the darker side of family, the way that a parent can use a child’s need for love as a weapon, refuse them a right to their own identity and try to gobble up their future. Both Judith Allnatt’s ‘A Mile of River’ and Ross Raisin’s ‘God’s Own Country’ are set in the countryside but neither book espouses the Romantic notion of rural idylls and contented people. Both books deal with the effects of rural isolation and disturbed adolescence. Each has won critical acclaim. I stood in the middle of my father’s bedroom, holding my breath. It was quiet, except for the creaks and groans of floorboards and old timbers, expanding in the heat of an early summer afternoon, as if the house was stretching out, straining to listen too. The brass alarm clock next to the bed ticked fast and light. It was set for five thirty, to get Dad up for milking, and just the thought of the raucous noise of the bells brought me out in a sweat. I’d lied about having a headache today, so that I could stay at home to do this, and the lie had sat heavy on me the whole time, like a thick coat on a sunny day. From up in Deeper’s field came the stutter of the tractor. I crossed to the window, low in the eaves of the house, and stooped to look out. The yard was deserted except for some hedge sparrows fluttering in the dust, and a pigeon turning circles for its mate. Small white clouds moved steadily across the sky’s acres, taking with them any promise of rain. Their shadows passed slowly across the barley beyond the track, and the stems bent and stirred as the breeze combed through them. Distant on the hill, the tractor moved across the field, a Matchbox toy. It swung round tight on the turn; dad always aimed to eke every last load of beets from a field, and he was making sure he top-dressed every one. My shoulders dropped. Now I could start looking. I tried the dressing-table drawers, both were locked. I sorted quickly through the clutter of brushes and pencil stubs on top. No key. My eyes passed quickly over the bedside table with the clock and a brown bottle of aspirin, over the sagging bed with its pilled nylon cover in duck-egg blue, and rested on the wardrobe. I would have to go through his pockets. I opened the door carefully, although there was no one to hear me. My father’s jackets hung in a row like mute guardsmen, wide shouldered, with a masculine smell of tweed and corduroy. The floor of the wardrobe was a jumble of overalls and pyjamas. I almost folded them. I slipped my hand into the pocket of the first jacket, lifting the hairy material of the pocket flaps with my fingertips, and felt in the depths of the silky lining. I moved methodically along the row of clothes. Nothing. Only a few old receipts and auction tickets. Frustrated, I turned back to the dressing table, and caught sight of myself in the mirror, ghostly in my long pale dressing gown like the shade of my mother; slight and small boned, with the same dark hair. It curled where it was moist against my skin, and my face, usually pale, was flushed and intent, a trespasser’s face. The dressing table was old but not elegant, just an oak chest of drawers with a separate mirror standing on the top, but Dad was always proud of the length of time it had been in the family. The mirror was tilted, the bottom pushed forward. I tilted it further to look behind it. There it was, the box covered all over with seashells, tucked away between the mirror and the wall. Aunty Linda sent the box to Mum because they both longed for the sea, and Mum said she felt landlocked in the Midlands with hundreds of miles of solid ground in all directions, although at least here there was the river to watch. Then Aunty Linda went to live in Brisbane, so she got all the sea she needed. I used to think the box was beautiful when I was little, its thick coat of varnish making the shells look wet, cockle shells at each corner, long blue-grey razor shells, and tiny white snail cases, like seed pearls. I used to ask to lift it down off the shelf. I used to open it expecting to find a sift of fine sand, or a lick of sea salt in the corners. When mum left, I asked Dad if I could have the box. By then I was old enough to know that it was a cheap thing, a tacky souvenir from some grey seaside town, but he wouldn’t part with it. For a long time I thought, if I could just have the box, touching it would somehow be like touching her, that opening it would bring back her voice saying ‘Smell that sea air!’ I thought that it could replay her like a musical box. The tractor stopped and I listened. It was temperamental, prone to fuel-feed trouble; Dad might have to come back for tools. It started, then stopped again, then started and continued the long climb along the ridge. The sound of the engine ebbed and flowed, a long slow wave of sound that faded into the far corner of the field’s length, and then built again from the turn. The tractor noise reminded me of ploughing with my father, and how the past hides in the earth just below the surface; a medieval coin, a flint spearhead, a clay pipe, to be turned up by the ploughshare, as it unravels time like knitting, row by row. Deeper’s field was the highest on the slope, and the biggest one, huge once Dad had taken the hedgerows out which used to divide it into three. I remember that day, although I can’t have been more than five or six years old. I was sitting up high and proud on the hard tractor seat, and Dad was explaining how we were going to clear the field. Mum came running to the gate waving her arms, all upset because of the green-finches that were nesting in the hedges. Dad jumped down from the tractor and went and put his arm around her, I could see them talking and Dad shaking his head. Then Mum pulled away and walked back to the house. The hawthorn bushes were going to be stubborn. Dad rigged the tractor up with great chains, hooking them to the hitch point below the axle so that the tractor couldn’t tip. I had to stand well back up the field whilst he hauled the bushes out. When he was done I ran forward to see them laid out flat with their roots in the air. In the earth underneath was a muddle of rocks and scattered bones. We stood together at the side of the trench; it was too late to stop me seeing. Dad told me that it must be an old Anglo-Saxon burial; the rocks were placed on the bodies’ chests to stop the spirits of the dead from walking. He told me not to tell anyone, we would keep it secret between us. ‘I don’t want a load of academics with their teaspoons and their little brushes traipsing all over my land,’ Dad said, and back-filled the holes the same day. Looking back on it I suppose a burial site sat badly in the middle of a productive field. Now the only mark to show where those people lie would be the darker green of the crop following the old hedge line. You would only be able to see it at all from a plane. But one day, despite the rocks, those bones will work their way to the surface to be turned up by the plough. The fields at the front of the house were divided by the half-mile track down to the road, and were mainly pasture. They fell away toward the woods and the river, featureless but for the random arrangement of cows, which resolved themselves into patterns of knots whenever rain threatened. Although these fields were grass covered, even here hummocks gave away the touch of medieval hands, working their allotted strip until the contours of the earth itself were changed to mounds and dips. Perhaps it was Garton land even then. The woods were always Mum’s favourite place. We used to walk along the river every day, and in the summer, take a picnic. When she was pregnant with Tom, she used to lie at the edge of the shallow stretch, with her legs right in the water. ‘Look, I’m a mermaid,’ she’d call out, ‘build me a pool.’ I would work away at the mossy stones, shifting them to build dams for her to inspect, whilst she sunned herself, her face tipped back, her hair fanned out on the grass, like a blackbird spreading its feathers in the heat. I picked up the box and weighed it in my hand. Such a small thing to ask. Farmer’s daughter Jess has a father who demands absolute loyalty and obedience. She must never mention the name of her mother, Sylvie, who left the family eight years ago. She must be mother to her younger brother, cook, house keeper and farm labourer all rolled into one. Jess finds her mother’s bird book, and alongside the entries about kingfishers and fieldfares she re-discovers memories and starts to unravel secrets. She begins to question her father’s version of the past and kick against his version of her future. Against the background of a scorching summer that is drying up the river, the very lifeblood of the farm, Jess struggles to decide who she is, her mother’s or her father’s daughter.